Water circulation in boiler can be classified in three different types of systems. Boiler feed water which is pumped with high pressure boiler feed water pumps first reaches at economizer. Here temperature of the boiler feed water is around the saturation temperature corresponding to its pressure. Saturation temperature means the temperature at which water vaporization is starts for a given pressure. It is also called the boiling point of water. Feed water flows through economizer gets further heated by flue gas and enters into the steam drum. Steam drum acts as a pressure vessel and separates steam and water from steam water mixture. Normally steam drum water level is maintained around 50%.It means steam drum is half filled with water & remaining 50% above the water level contains steam. Water inside the drum flows down through down comer pipes and distributed by bottom header to water walls. Down comer pipes are outside the boiler furnace while water walls are inside the furnace. Water rises through water wall tubes are exposed to furnace heat. When water rises upside in tubes, a portion of the water is converted into steam and continue to rise upwards as a mixture of steam and water. Heat absorbed in water wall is latent heat of vaporization creating a mixture of steam and water. The ratio of the weight of water to the weight of steam in the mixture leaving the heat absorption surface is called circulation ratio. This mixture is continuously rises till it reaches back to the steam drum. Separated steam from steam drum is sent to the turbine. 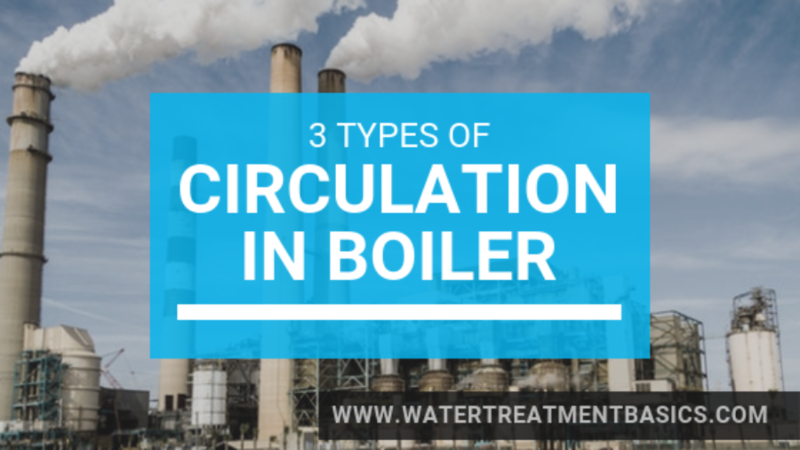 The value of circulation ratio varies from 6 to 30 in industrial boilers. Circulation ratio for utility high pressure boilers is between 6 to 9.Circulation ratio is higher side as the density difference between steam & water is high. Medium pressure industrial boilers adopted higher circulation ratio. These boilers have to respond quick load changes. The circulation, in this case, takes place on the basis of thermo-siphon principle. The Down comer contains relatively cold water, whereas the riser tubes contain a steam & water mixture, whose density is comparatively less. This density difference is the driving force, for the mixture. Circulation takes place at such a rate that the driving force and frictional resistance are balanced. As the pressure increases, the difference in density between water and steam decreases. (See Fig. 3). Thus the hydrostatic head available will not be able to overcome the frictional resistance for a flow corresponding to the minimum requirement of cooling of water wall tubes. Therefore natural circulation is limited to boiler with drum operating pressure around 175 kg/cm2. If the Operating pressure of boiler is between 180 kg/cm2 to 200 kg/cm2 then circulation in boiler is to be assisted with mechanical pumps, to overcome frictional losses. To regulate the flow through various tubes, orifice plates are used. This term is generally applicable in boiler water treatment.The concept is same as Strong Acid Cation(SAC) column works in DM Plant. To measure cation conductivity water sample is passing through cation column filled with cation resin in the hydrogen (H+) form. It is also known as acid conductivity. 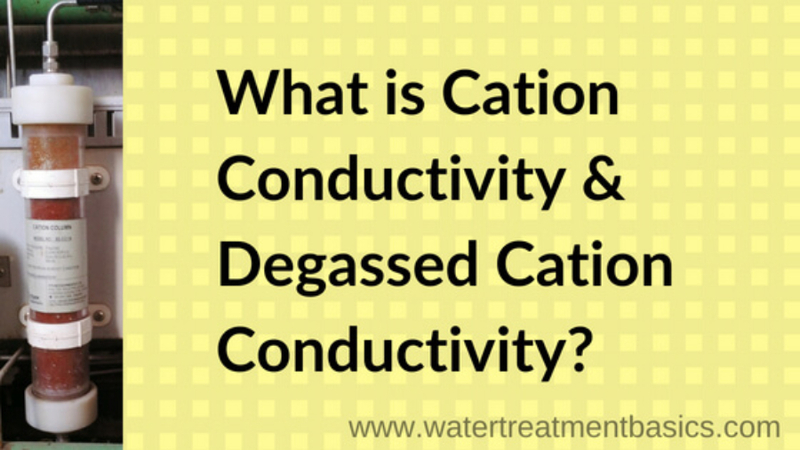 Cation resin removes positively charged ions (cations) & replaces with H+ ions. In a high purity water cation present in ppb levels very small amount. For instance,If NaCl is present in this case when we passing sample through cation column Na+ ion is removed & Cl– ion react with H+ ion produces HCl (hydrochloric acid) that have a higher conductivity. Please keep in mind that particular cation or anion is separately not present in water. Always they are present in combination with each other. e.g. NaCl,MgCl2 etc. As name suggest it is a measurement of the conductivity after removing cations from water sample. it is indirect measurement of anions present in water, mainly chloride & sulphate present in steam samples. In other words cation conductivity magnifies the anion present in water & indicates steam purity. Most steam turbine manufacturer recommends cation conductivity limit of <0.3 µs/cm. High level of anion contamination present in water. In practice, well controlled & maintained feed water chemistry can consistently maintain cation conductivity below 0.5 µs/cm when using organic amine and organic oxygen scavenger. The degassed cation conductivity measurement uses the same ion exchange strategy as the cation conductivity measurement. The degassed measurement incorporates a reboiler to remove volatile compounds (like ammonia, amine, volatile organics, and CO2) from the steam to provide a more accurate indication of sulfate and chloride levels. In the degassed measurement, the sample passes through a reboiler. Volatile organic compounds and CO2 are vented to atmosphere. Non-volatile inorganic compounds (like sulfate and chloride) remain behind. Thus, the degassed cation conductivity measurement provides the most accurate indication of inorganic anion levels (salts) in the steam. Most steam turbine manufacturers recommend cation conductivity limits of 0.2-0.3 uS/cm. As stated earlier, the steam turbine manufacturer limits are not realistic unless ammonia and hydrazine are the only products used for feedwater treatment. In practice, well-controlled feedwater chemistry can consistently maintain cation conductivities in the 0.4-0.8 uS/cm range when using organic amine or organic passivators.